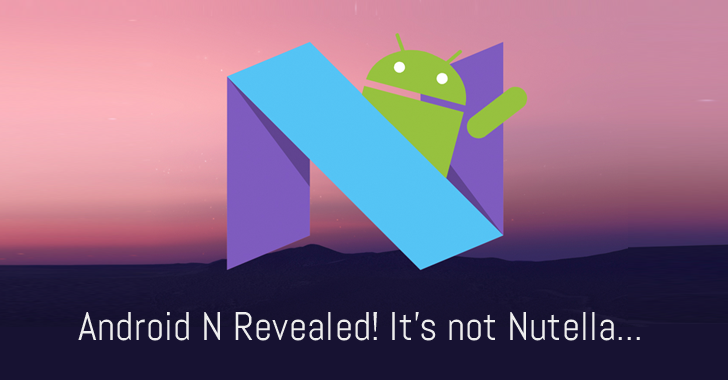 Google has finally announced the official name of the latest version of its Android mobile software, codenamed Android N: "Nougat." Yes, the next version of sugary snack-themed Android and the successor to Android Marshmallow will now be known as Android Nougat, the company revealed on Snapchat and Twitter. The announcement comes days after Google set up a website for users to submit suggestions for the name of Android N.
Android has maintained its tradition of naming its Android mobile operating system by the names of alphabetically-ordered sugary delights starting from Android Cupcake, Donut, Eclair, Froyo, Gingerbread, Honeycomb, Ice Cream Sandwich, Jelly Bean, KitKat, Lollipop, and Marshmallow. The final release of Android Nougat is still in beta and due later this summer. The good news is that the Google Android team has brought several meaningful features to your smartphone and tablet with the release of Android Nougat. Android Nougat will bring a redesigned notification panel, a split-screen multi-window mode, VR enhancements, seamless updates, a new Data Saver mode, support for side-by-side apps, and a lot of other improvements. If you want to try Android Nougat, you can download the latest developer preview of Android Nougat as long as your device is supported.